Wanted to share and thought it might be good convo for the board to. No jokes here. Shooting is an Olympic sport. Target shooting is one of the oldest sports ever (Archery) and was one of the main events of the first ever Olympic games. So please gun haters check your views. I wouldn’t kill people unless I'm forced to protect myself or family. I like shooting for sport so no politics crap please. I'm not so into hunting game but have done so. Never deer because I think deer are just a docile animal that just like to do their own thing and pose no threat of hunting me back. So I don’t see the excitement in killing deer except for food. And I’ve never ate one so I’ve never killed one either. But I’ve hunted wild boar and that was crazy. They weigh about 450 lbs. and run at you about 25mph with 8-12 inch long tusks and are ready to rampage you and eat....lol. And sometimes they come in packs. You gotta be fast and accurate. And ya know how some basketball players are clutch and some choke under pressure......well in this sport if you choke you get hurt.....bad. and internal stabilizer to steady targeting. (inside gun, cant see but it's important. Its the equal to shooting what a basketball player would be to shoe's). And that’s a steel 30 rd. magazine. I’ve used this rifle in major competitions and have 4 wins, 9 second place and 6 third place finishes. I have only failed to qualify 1 time and it’s because I was deducted points for breaking a rule I had never heard of before. In decent wind conditions (under 25 mph) I can shoot a consistent 4-5" pattern from 150 yards away after I've dialed in my scope and Laser sight. And my UZI IMI 9mm Baby Eagle/Jericho with extended 40 rd. magazine....this baby can unleash hell. Edited by LakersGAFan, October 14, 2009 - 04:00 AM. Sounds like fun. Always heard boar hunting was fun/scary. Nice gun. My friend is heavily into shooting, not in competitions or anything, but his Dad was a sheriff so they've got a bunch of guns and a bunch of places that they are allowed to go shoot. Plus he gets to shoot many guns that aren't available to the general public. I've never shot a real gun though. thats cool. Law enforcement gets to test lots of new stuff to. You should roll with your friend and dad sometime and try it out. Do they go to a range/club or to the woods somewhere private to let em rip? Cool, I would like to go to a shooting range someday. The only shooting that I do is thru paintball and that's fun too. yea, Paintballs mad fun. You should try shooting sometime. Its fun. My family out east are big hunters. My Uncle that was in the military shoots around 10 deer a year. It's crazy. When I move up to Michigan this year I'll be getting a rifle. I'm thinking about a Remington. Don't you wish your boyfriend is as HOT like me? Location:15 minutes from Staples Center. Fan Since:The GW Forum days. Nice. My upper just arrived today from Bravo Company. I'm building an AR15, but I can't shoot it yet until I get the charging handle. I use mine mainly for target shooting, maybe later take a carbine tactical course. Yes, I need to update this banner...Let's go Lakers!!! sweeeeeeet. your building it from ground up. Ive never done that. I'm solid untill I get to the trigger mechs. I hate anything with spring retension...lol. What brand parts are you buying primarily or are you just getting a mix? Desert Eagle .45 = one of the best side arms ever imo. I like the Kimber Raptor .45 better but both are superb guns. I'm not gonna lie I just like the way the Kimber Raptor looks more. Performance wise both are at the top of the game though. And aint no shame in a .38 revolver for self protection. Thats a gun that will put a Shaq sized man on his arse. 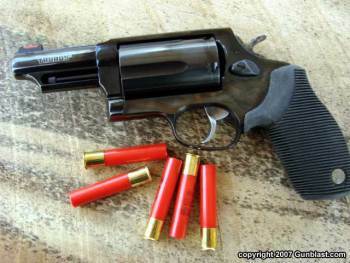 Is it a snub nosed (short compact barrell like in The GodFather movies) or a long barrel like the old western movies. Parents always have tight guns. My dad recently bought a revolver. Its called "The Judge". Its an amazing side arm for personal protection. The pic below isnt his because he has a 3.5" barrell and his is chrome but it will give you the idea. It holds 6 rounds, 5 shot gun shell type rounds and one single .45 caliber bullet. My dad took it to the range a week or so ago and said it tottaly destroyed a full grown Pumpkin at 6 feet away. He said the first shell he fired obliterated the pumpkin. It was mush mixed with a few hard areas. Awesome power for in home self protection because you dont really have to aim. Just point in the general area and you hit everything in 6 feet. Edited by LakersGAFan, October 14, 2009 - 04:14 AM. This is my gun. It can kill you from 50 feet away. The truth is ammo got very expensive after Obama won and the democratiic party took control of congress. Gun enthusiasts think the democrats will try to ban assault weapons and high capacity magazines like they did in California and/or put a 400% tax on ammunition. Obama voted for a huge ammo tax hike for Illionis when he was Senator so people have reason to be weary. But his motivations then were to curve inner city Chicago crime. Not limit sport shooting as a hobby. So basically people panicked and went out to buy everything they could including ammo. It caused a supply shortage to the demand so the price went up at retail. Personally Obama himself said he respects hunting as a sport and supports the 2nd amendment and that a 2nd amendment revision is no where on his radar "at the moment". I believe him in regards to that. Hes got more important things to worry about than gun laws (healthcare, security, economy). Its Pelosi, Boxer and Fienstein (team Cali) that gun supporters are really worried about. They will try to make a gun limitations bill to act like their combatting crime and doing something good for society. Heres a fact. California has the strictest gun laws in the nation followed by New York state. In result California still has the most crime per capita of any state in the nation followed by New York state in second. Gun laws dont keep criminals or criminal organizations from getting guns. It keeps normal citizens from getting guns and having the ability to protect themselves, family and property againts the criminals. dude, i know it's not guns but have you tried playing airsoft? yea, airsoft is fun. So is paintball. but I like paint ball more.